Today’s threat landscape is nothing like that of just 10 years ago. Simple attacks that caused containable damage have given way to modern cybercrime operations that are sophisticated, well-funded, and capable of causing major disruptions to organizations and the national infrastructure. Not only are these advanced attacks difficult to detect, but they also remain in networks for long periods of time and amass network resources to launch attacks elsewhere. Traditional defenses that rely exclusively on detection and blocking for protection are no longer adequate. 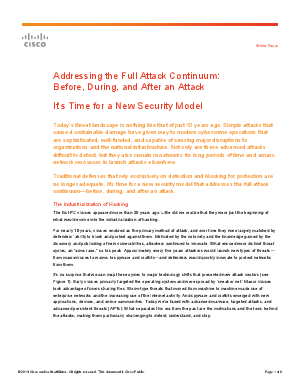 It’s time for a new security model that addresses the full attack continuum—before, during, and after an attack.